Born in Salisbury in 1883, Ruby Davy was a shy child who demonstrated early musical prodigy and went on to become Australia’s first woman Doctor of Music. By the age of 13, Ruby was already teaching 27 of her own pupils at her mother’s Salisbury School of Music. She began studying at the Elder Conservatorium of Music in 1904 at the age of 20, gaining in the same year the university’s Associate of Music. 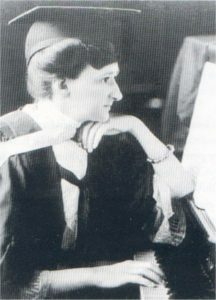 Ruby was the first Conservatorium student to take composition as a principal subject. Ruby graduated in 1907 and continued to teach music at the Salisbury School of Music and from a studio at Allen’s Music Shop in Rundle Street, in addition to performing and accompanying other artists. In 1913, at the age of 30, Ruby began her Doctorate of Music studying Violin, flute, oboe, clarinet, bassoon, French horn, trumpet, trombone, kettle drums and other instruments of percussion, and graduated as Australia’s first woman Doctor of Music in 1918. There followed a prosperous and happy period for Ruby, teaching music and performing while her mother managed all household and business affairs. The sudden death of both parents in 1929 led to a nervous breakdown and the closing of her music school, by then located in Prospect. At the age of 51 Ruby sought a fresh start in Melbourne. She opened a new music school and gave well-attended lectures and recitals to societies and audiences. In 1939, Ruby organised a three-year tour of England, Europe, Canada and America. Upon her arrival in London, Ruby immersed herself in the local music scene, but the onset of war saw the cancellation of all theatrical and musical performances. Regulations were relaxed after the expected air raids did not eventuate and Ruby was able to give her planned series of lecture recitals at Wigmore Hall as well as some radio broadcasts. Ruby was, however, continually affected by ill health and money difficulties and in May 1940, exhausted, still short of funds and unable to cope with the cold climate, left England for America where she gave a number of acclaimed recitals and broadcasts before returning to Melbourne. Increasingly frail, Ruby died in Melbourne in 1949. Her body was returned to Adelaide for burial. Ruby left 300 pounds in her will to the University of Adelaide to provide a scholarship in her name, which survives today as the Dr. Ruby Davy Prize for Composition. (The above account is largely derived from Rita M. Wilson’s “Ruby Davy: Academic and Artiste”.